CalProg Presents "An Evening with Terry Bozzio"
Los Angeles, CA – Drum legend Terry Bozzio, known for his work with Frank Zappa, Jeff Beck, UK and his critically acclaimed solo ventures, celebrates his latest release “Terry Bozzio Composer Series” with “An Evening With Terry Bozzio” US tour! This will be a night of solo drumming and include compositions from throughout his career, as well as improvisation. It is by no means a clinic or a workshop. Enjoy an intimate evening of Terry Bozzio and his monster sculpture of a drum kit together for the first time in seated venues across Europe and the United States. 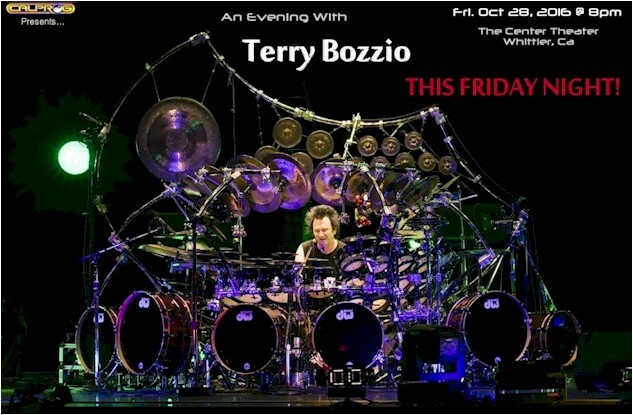 “TERRY BOZZIO - An Evening of Solo Drum Music” is a unique, intense, dynamic, spiritualistic, melodic, orchestral, atmospheric, and musical performance on the largest tuned drum & percussion set in the world. Unless you have seen Terry, you have no idea what you are in for. Bozzio is an enigmatic, evocative, and engaging musician whose instrument just happens to be the drums. Terry Bozzio is able to accompany himself with bass note patterns and, at the same time, melodically solo on top with highly developed coordination skills to express a complete musical statement on the drum set alone. Drawing from jazz, classical, & ethnic percussion styles from around the world, Terry Bozzio is “a storyteller,” able to weave a hypnotic spell over audiences and enthrall them with an eclectic experience filled with contrast, variety, intimacy, excitement, & passion. “Terry Bozzio Composer Series” was released in Japan in the fall 2015! 59 Compositions, with 59 Paintings for each title on a 4 CD, 1 live performance/interview/drum setup DVD & Art Booklet in a Vinyl Sized Package! (On the Ward Records Label). For those of you who may have seen Terry on tour, the house music he played was only some of this material! 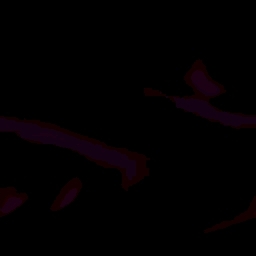 Terry has been composing in & beyond all genres for several decades: Classical, Fusion, Electronic, Ambient, Rock & Jazz! Terry just finished a sold out Tokyo show called “The History of Terry Bozzio”, w/ a Japanese All-Star Band, filmed for TV Broadcast and an upcoming DVD (Oct. release - Ward Records). He performed and sung tunes from his past recordings w/ Zappa, Beck, UK, Missing Persons, Bozzio Levin Stevens, Brecker Bros. & Billy Sheehan! Terry plans to mount this show in Europe & the US in future. August 16, 2016 US-NV-Las Vegas, Tuscany Hotel NEW!! !